The Arburg Technology Days have been around for 20 years now. Between 1999 and 2019, more than 93,000 guests from all over the world attended the highly regarded industry event. Between 13 and 16 March 2019, more than 6,000 visitors from 54 countries joined the event. Around 660 actively involved employees and trainees ensured that the Technology Days were a special event for everyone. 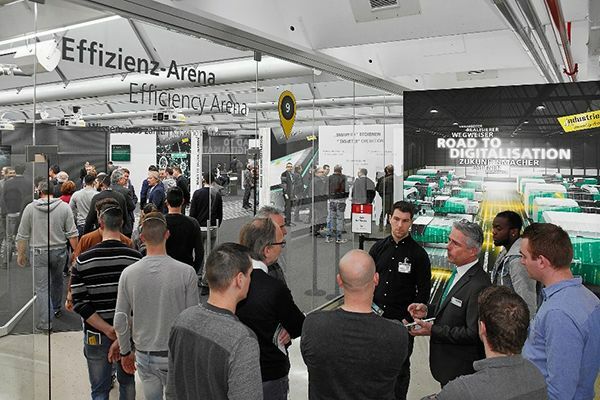 The main focus was on the “Road to Digitalisation”, along which the guests were able to gather comprehensive information about Arburg’s digital components for production-efficient plastics processing. More than 50 machine exhibits and turnkey systems, the Efficiency Arena and a special service presentation were also showcased. Highlights included the “AM Factory” and the “arburgXworld” customer portal. Expert presentations on current trends as well as guided tours of the operating factory rounded off the programme. 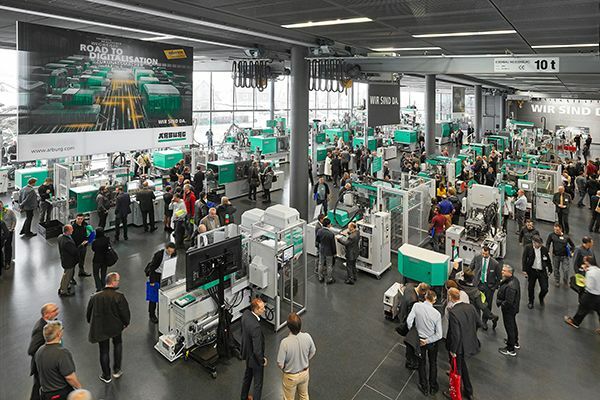 Since 1999, the Arburg Technology Days have proved to be a successful concept, making it the world’s largest in-house event in the plastics industry. The share of foreign visitors has steadily increased over the years, reaching 44 per cent this year. In 2019, the largest groups from overseas were around 140 participants from North America and 110 from China. Most of the European guests came via the subsidiaries in France (around 200), Switzerland (around 190), Italy (around 160), and the Czech Republic (around 110) as well as the Netherlands and Austria (around 100 each). “We have been travelling on our ‘Road to Digitalisation’ since Fakuma 2018, heading for K 2019. During the Technology Days, it was the overarching theme throughout the company. In this way, we have reached another milestone and made a complex topic more tangible,” summarised Michael Hehl, Managing Partner at Arburg. As a pioneer in the plastics industry, Arburg presented all that it is currently able to offer in terms of “smart machines”, “smart production” and “smart services” along the “Road to Digitalisation”. One highlight was the “arburgXworld” customer portal which, after registration, can now be used by German customers free of charge with the “Machine Center”, “Service Center”, “Shop” and “Calendar” apps. Arburg bundles its digital services via this service marketplace in the cloud. The apps can provide a quick overview of the machine fleet, enable easy ordering of spare parts with interactive navigation and allow the creation of service tickets around the clock. On the subject of digitalisation, Arburg’s OPC UA solutions were also presented, illustrating how they can be used for the online provision of process information to higher-level systems and digital services. Allrounders were equipped with an IIoT gateway (IIoT = Industrial Internet of Things), offering great flexibility for the implementation of, for example, Arburg Remote Service (ARS), the Arburg Turnkey Control Module (ATCM), “arburgXworld” and the Arburg host computer system (ALS) through which all exhibits were networked. Each Allrounder in the Customer Center contained Arburg’s six assistance packages as digital components. They actively support the operator and make it easier to work on the machine in line with the production requirements at hand – from start-up, set-up and optimisation, to production and monitoring, up to and including service. A hybrid Allrounder 920 H in operation was used to demonstrate the potential offered by a filling simulation that is integrated into the Gestica control system. For the first time, it became possible to visualise the correlation between filling level and screw stroke. In the Efficiency Arena, Arburg experts demonstrated the virtual maintenance of an injection unit via AR data goggles and video calls. This allows complex maintenance work to be carried out safely and faults to be identified and rectified quickly. Real-time monitoring of the condition of wearing components (condition monitoring) and predictive maintenance can prove useful in preventing malfunctions and unplanned downtimes. Among other things, load-dependent toggle lubrication on electrical machines and the detection of contamination on vacuum valves were presented. In addition, the control system will in future be able to detect whether the correct cylinder module has been installed via a chip on the injection unit. Profoam. In addition, some customer applications from the automotive industry were on display. The largest component – a car front grille made of ABS – was produced on a hybrid Allrounder 1120 H with 6,500 kN of clamping force and Gestica control system. Another innovative application for medical technology was the production of labs-on-a-chip using assembly injection moulding. Using a Weber 2+2-cavity mould, an electric two-component Allrounder 520 A first produced two plates with connections for the fluidic supply plus two plates with fluidic channels. The mould then rotated electrically by 90 degrees, placing the two different plates directly on top of each other and joining them firmly together during the next injection process. In this way, a complete sealed lab-on-a-chip was produced in a total cycle time of around 35 seconds, including connections for the supply of fluidic solutions. Cross-connectors made of PVC-U, which are used as connectors for dialysis tubes, were manufactured on a stainless steel electric Allrounder 370 A installed in the Arburg class ISO 7 clean room. The clean room machine meets the high hygiene requirements of ISO 13485 as well as FDA specifications and GMP guidelines. The “turnkey solutions” area with nine machine exhibits proved very popular. Two of these exhibits were equipped with the new ATCM (Arburg Turnkey Control Module) Scada system. As an example, the production of spirit levels on an electric Allrounder 470 A showed how the ATCM collects and combines the process and test data and visualises the key functions of the complete production cell. There was considerable interest in customer systems which Arburg implemented as primary contractor and which highlighted trends such as the manufacture of hybrid components and turnkey systems with optimised installation area. As one example, a hybrid Allrounder 470 H overmoulded metal contacts with PBT (GF30) to form connectors for sensors in motor vehicles. This was followed by 100% continuity, high-voltage and optical testing before the good parts were deposited ready for shipping. Arburg implemented a particularly small footprint around an electric Allrounder 520 A. The entire turnkey system including the Multilift Select robotic system and the conveyor belt integrated into the protective housing is just 500 millimetres wider than the machine itself. An electric Allrounder 470 A demonstrated how optimum efficiency could be achieved by optimally matching injection moulding machine, mould and automation. The machine produced two 30-ml disposable cups made of medical PP in a cycle time of around 2.9 seconds. The mould was from Hofstetter, the automation from Hekuma. During the Technology Days, seven Freeformer 200-3X produced functional components from qualified standard granulates and special original materials, including materials with FDA approval for medical technology. One highlight was the new Freeformer 300-3X with three discharge units. It is the first machine capable of additively manufacturing resilient hard/soft combinations with support structure from three components. The exhibit produced movable gripper fingers made of ABS, TPE and support material – in a single step and without requiring additional assembly effort. The added value that the Freeformer 300-3X offers in fully automated and IT-networked production cells could be seen at the world premiere of the AM Factory. As an example, the complex turnkey system individualised vacuum grippers for chess pieces in six versions – “on demand”, fully automated and 100 per cent traceable. After marking it with a DM code and plasma treatment, the Freeformer 300-3X completed an aluminium gripper plate with a functional TPU geometry adapted to the desired chess piece according to the 3D print job. The next process step was a tactile, functional test of the gripper. Handling of the gripper plates, loading of the build chamber and functional testing were performed by a six-axis robot. Using the DM code, the data could be accessed at any time on a product-specific website. The main focus of the special service exhibition was on digital solutions from Arburg. This included the new “arburgXworld” customer portal and the Arburg Remote Service (ARS). The latter was presented using a hydraulic Allrounder 320 C Golden Edition. With regard to the customer portal, service experts gave practical examples of the advantages offered in terms of searching and ordering spare parts, creating tickets and communicating with service technicians. Arburg’s expert presentations, given in German and English, on “Automotive engineering”, “Freeformer”, “Packaging” and “Road to Digitalisation” were attended by more than 1,400 participants this year. In addition, more than 1,900 guests took part in over 200 in guided factory tours. There were also numerous foreign groups who enjoyed a guided tour of the factory in their national language, accompanied by the respective representatives from their Arburg subsidiaries or trading partners.